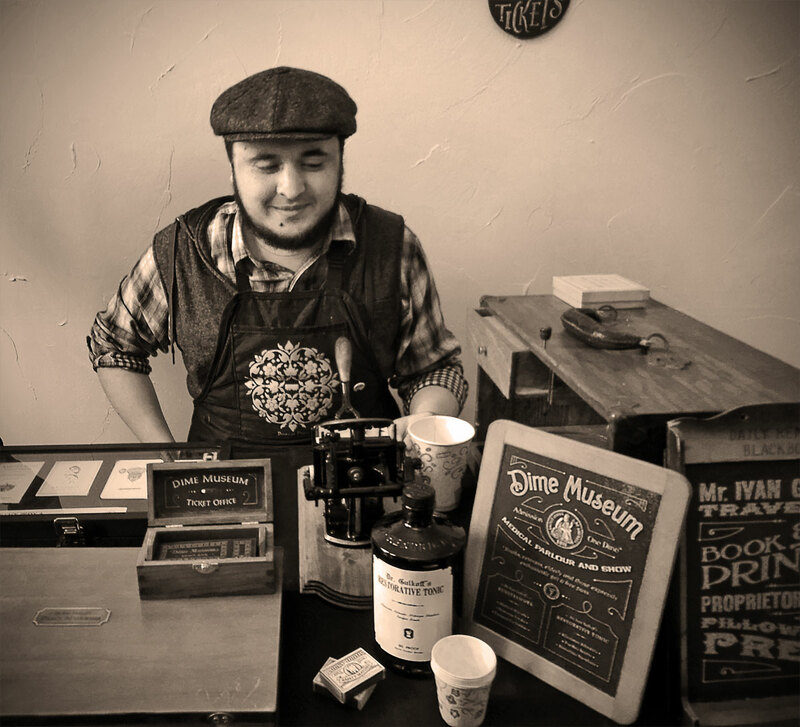 A Traveling Dime Museum of Dr. Gulkoff (a distributor of therapeutic tonics and a printer of pleasing paraphernalia) welcomes visitors and voyeurs since MMXVI. *Kids, veterans, elderly and those expressly enthusiastic get a free pass. 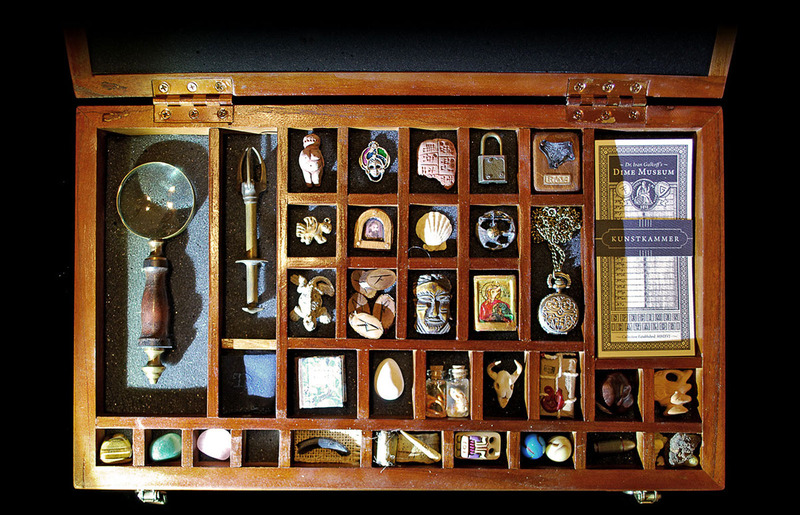 Owing to it's prodigious name, most of the specimen are knock-offs and forgeries of real or cryptozoological beings, figures of literary fiction and flights of fancy. 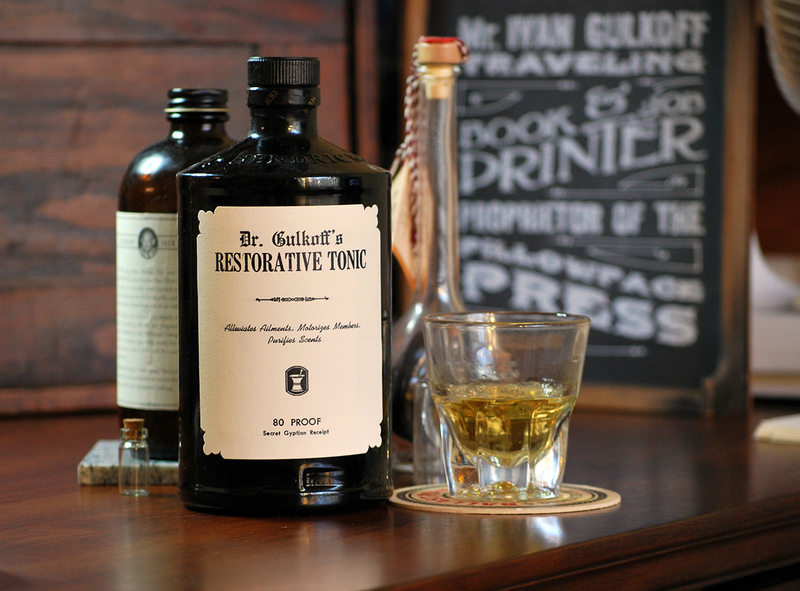 Don't forget to take a sip of Dr Gulkoff's Patented Restorative Tonic! 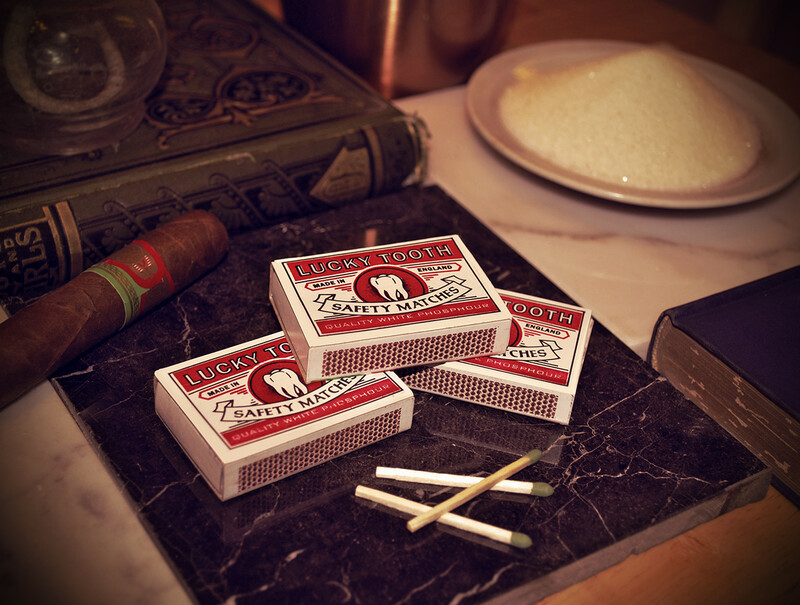 Quality white phosphorous matches, also available at the Pillowface Press traveling print and medicine show! 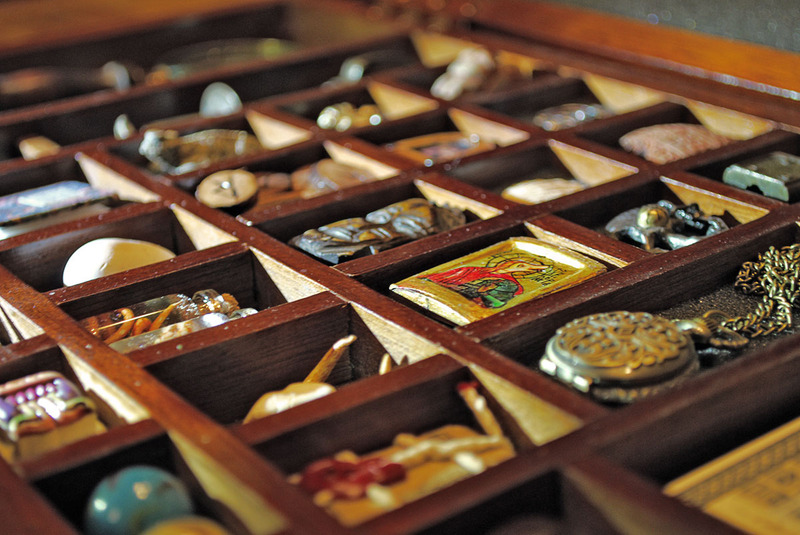 That really is an impressive cabinet of curiosities, and a very neat video too. 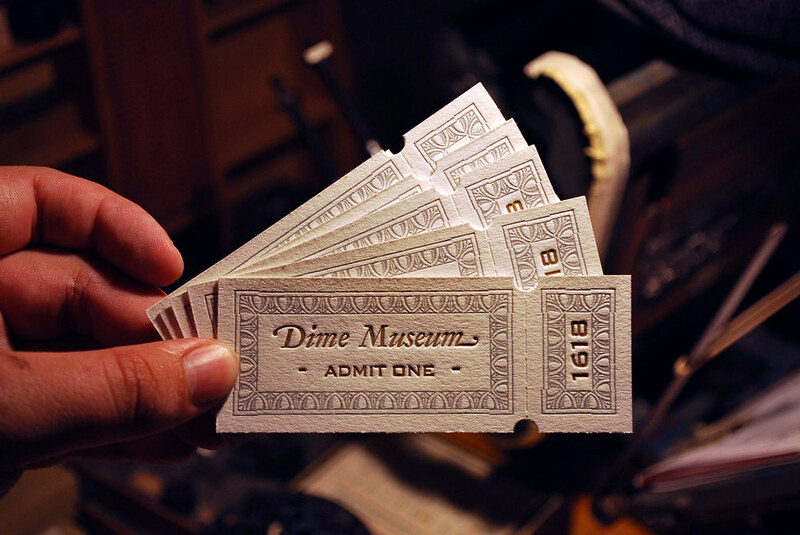 Thank you for giving us a 'pass' on the cost of admission! These were really fun to do. 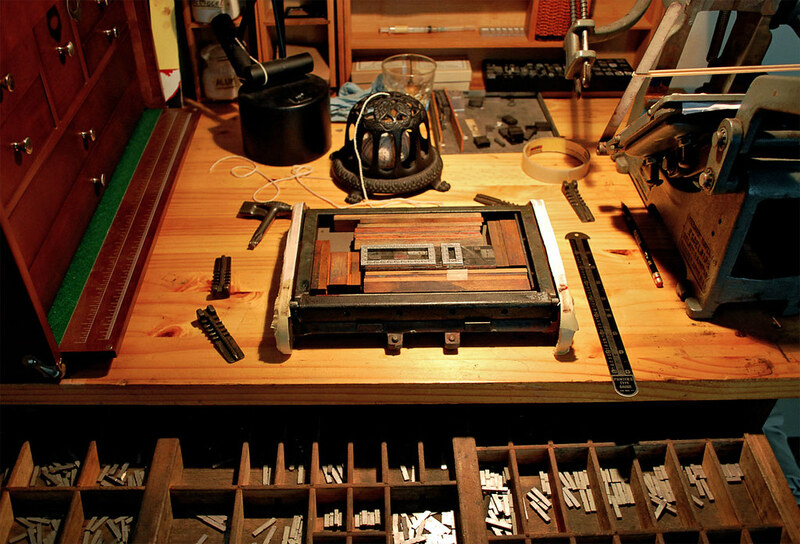 I made a traveling miniature letterpress printshop in a box some time ago (inspired by the tradition of tramp printers) but kept thinking it needed a companion piece. 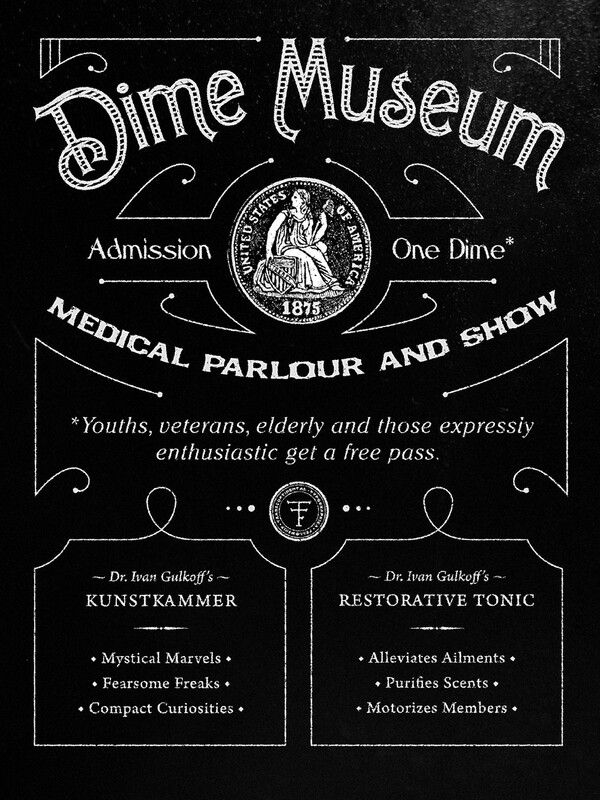 Medicine shows and dime museums seem like a good match. The specimen are mostly inspired by mythology and literature, like a shrunken piece of the shagreen skin, or a Lilliput skull. The tonic is currently just vodka infused with some anise seeds and sugar (experiments with more complicated concoctions weren't particularly successful). 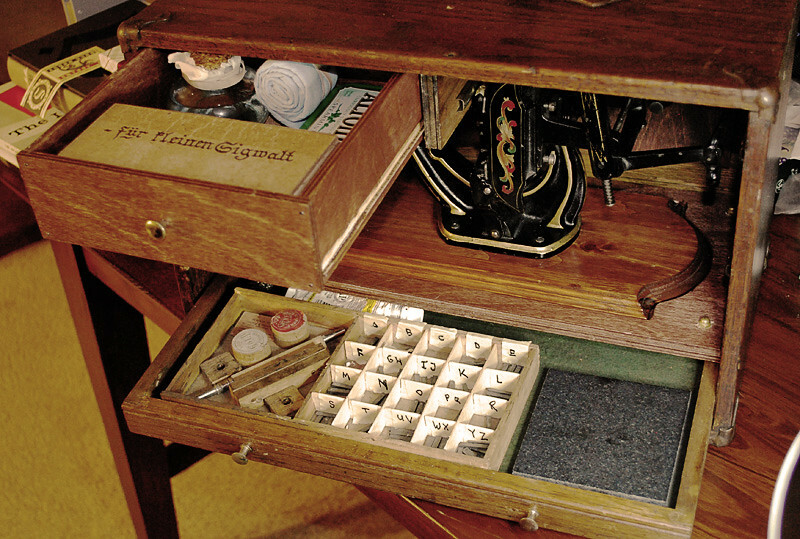 Currently, the box is housing Sigwalt Chicago #9, an 8pt Roman №801 all-caps font, silver and bronze powder, a wooden composing stick, boxed roller, a tube of black ink, some spaces, furniture, a granite imposing stone, kerosene bottle (for washup), machine oil and a rolled up shop rag. 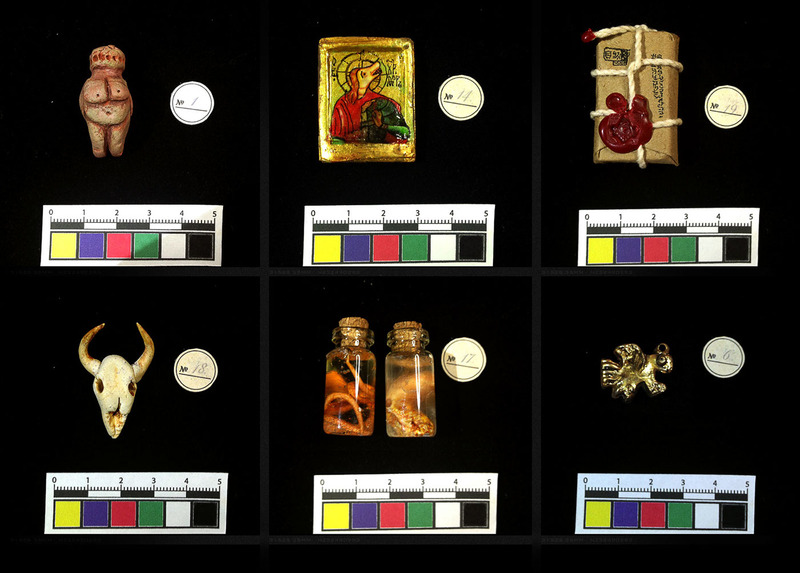 The idea is for all three (museum, medicine and printshop) to work in unison. 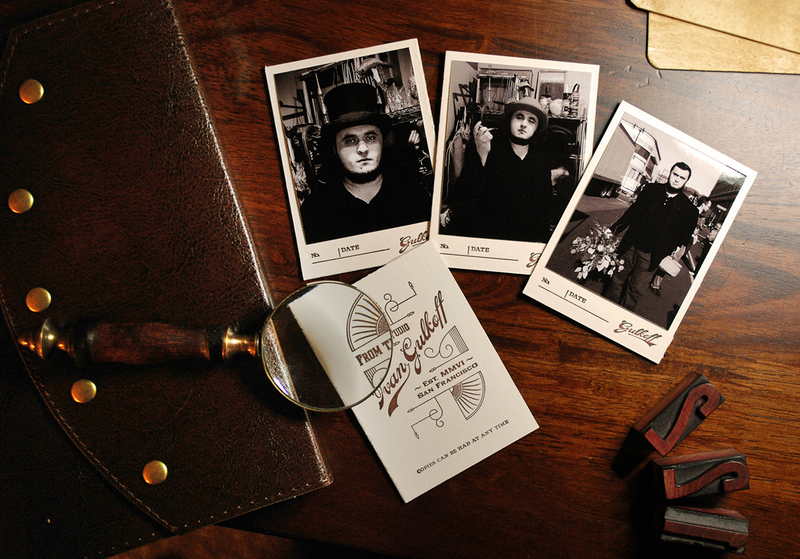 So, for example, you can take a sip of the tonic and chat about exhibits while a card is being printed. I was a bit hesitant of posting it, as it seems rather far removed from the realm of retro futurism. 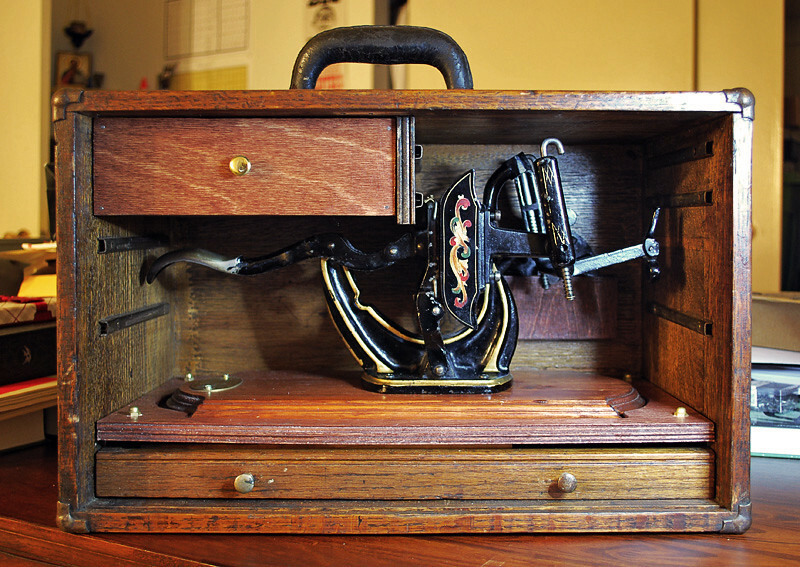 Tramp printers were a real thing, even though, these noble vagabonds were never known to walk about with miniature printshops, preferring to travel lightly with nothing to their name but a journeyman card and a trusty pica stick. 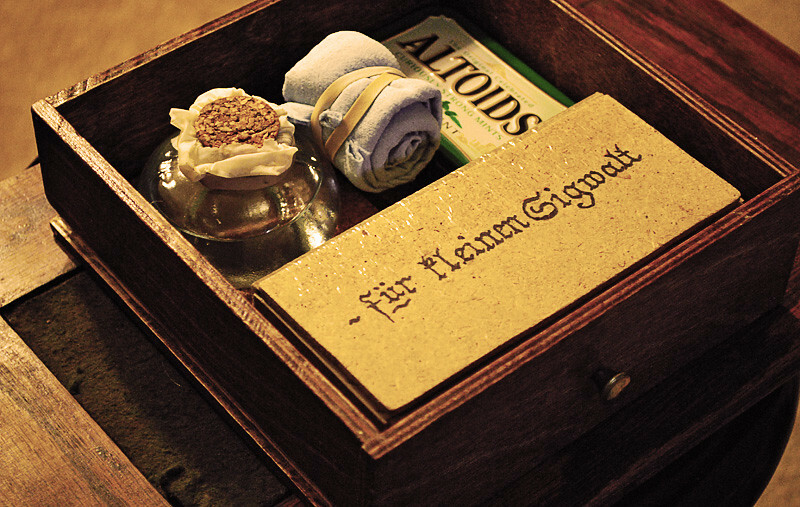 But, after all, figured it just might slide, as a wistful re-imagining of period technology and lifestyle. Retro futurism?!?! 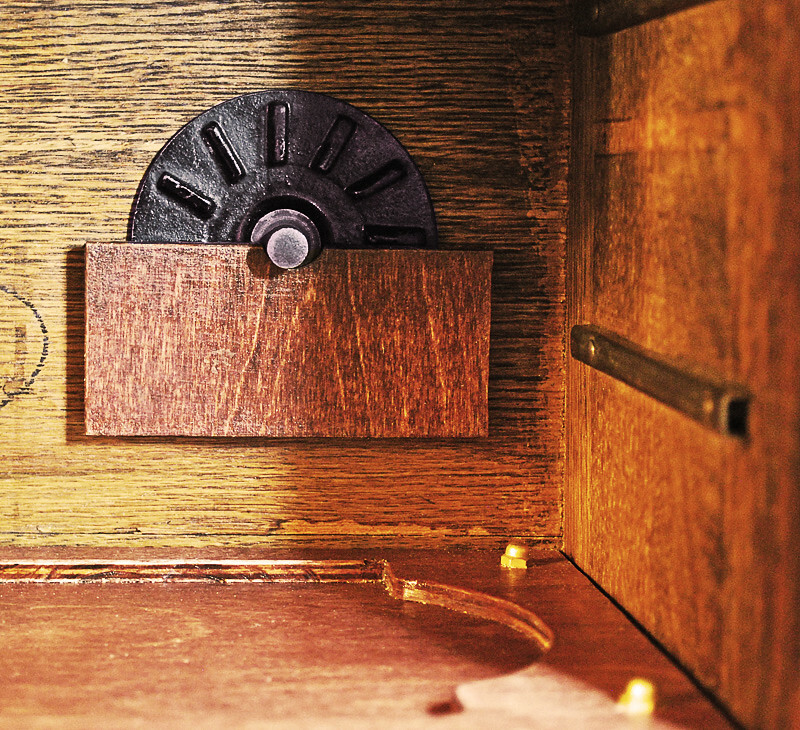 Have you seen what goes on with Steampunk? Any and everything! Post away, your stuff is great! A quick hint: You can usually find these grabby things on ebay, if you search for "olive tongs". That is a very impressive introduction, sir! Welcome to Brass Goggles! Yay, thanks for a very warm welcome! To complete the introduction, allow me to pass my card. 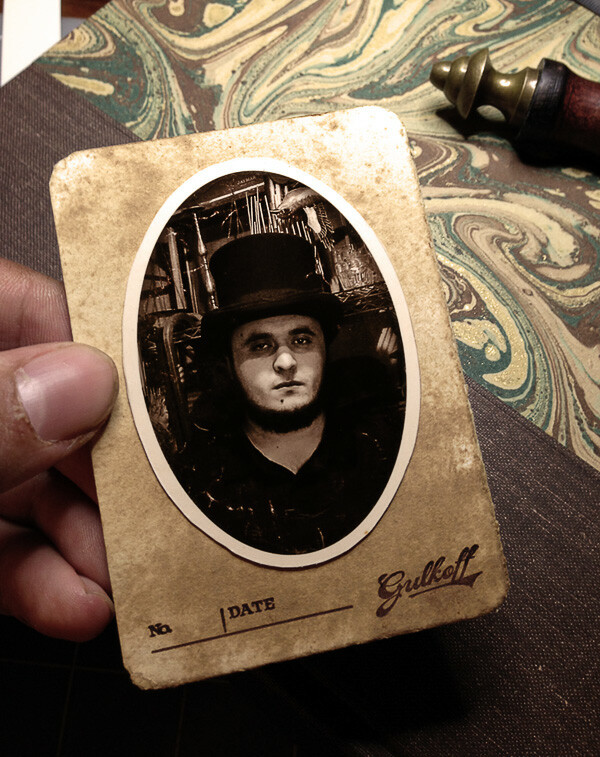 Carte de Visite — a petite version of the better known Cabinet Cards. Experimented with coffee staining and round corners, and decided I like plain square form better. Wetting fuzzed crisp lines and erased the slight relief. Still, could have it's uses. 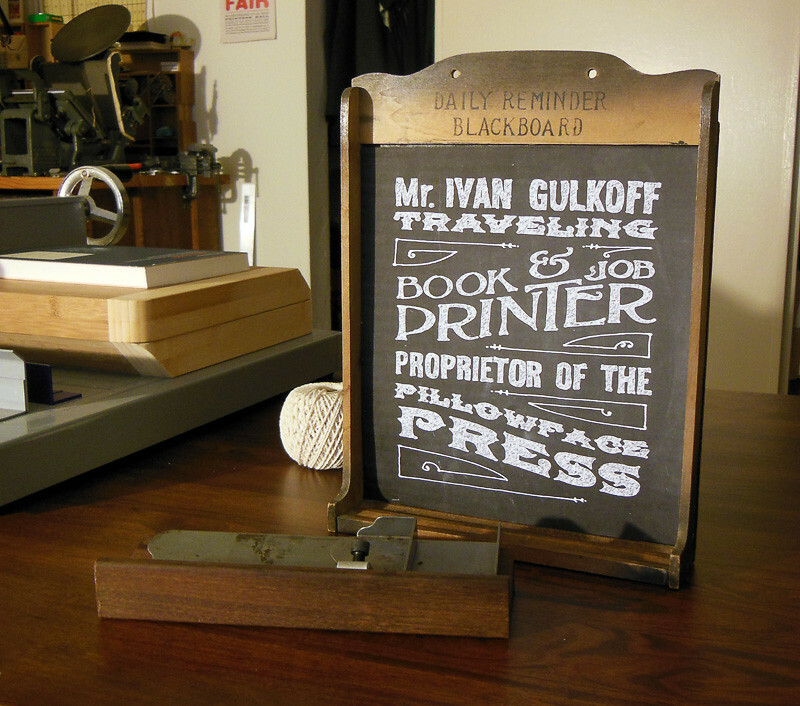 Printed letterpress on a 5x8 Kelsey with brown oil-based ink. Thumbs up from me, some mighty grand stuff going on here. Good job, welcome and please do post more of your work as and when you do any. Great work, detail and all. 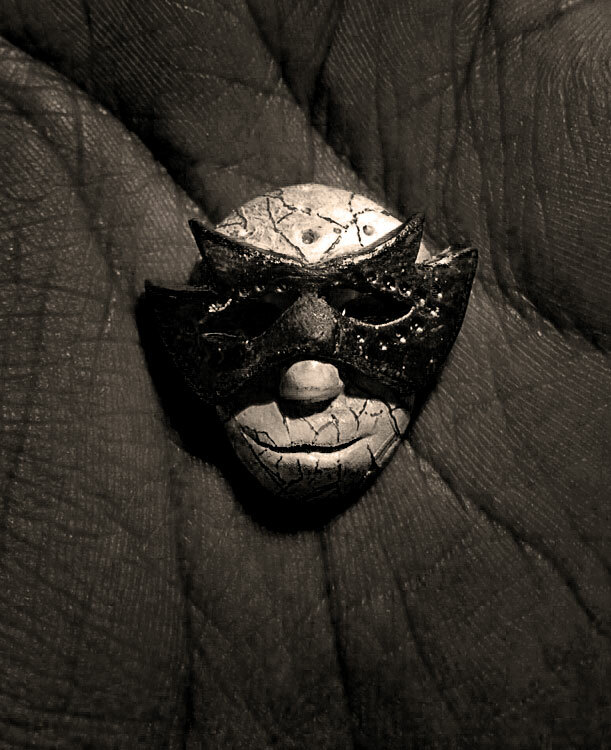 This carnival brooch belonged to Count Alain of Vignole, executed by the Venetian Council of Ten. 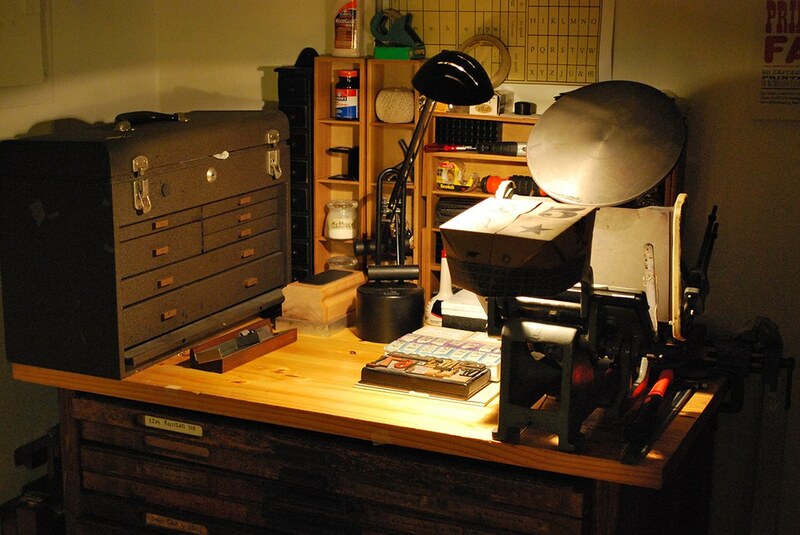 Tramping printshop packed up for San Jose Printer's Fair at Kelly Park. 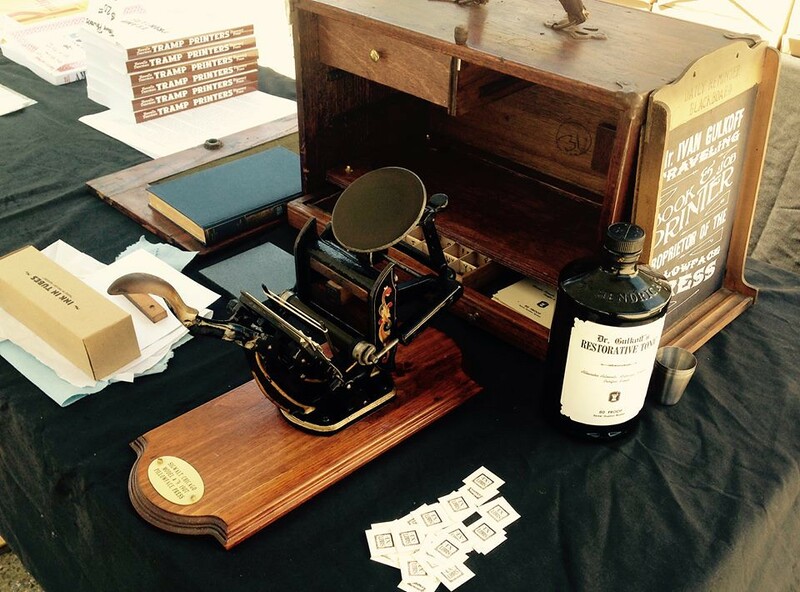 My humble stall at the fair, printing world smallest* bookplates with a world smallest complete** printshop in a box. 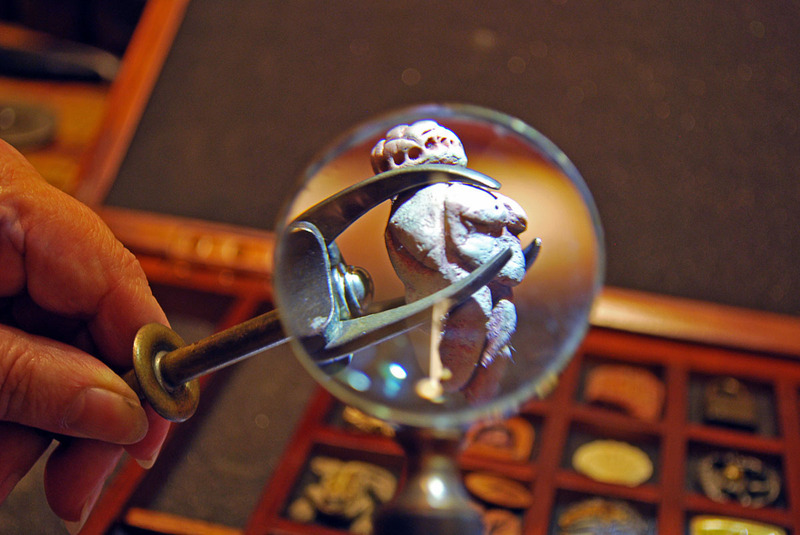 What a delightful travelling dime museum, oprion. 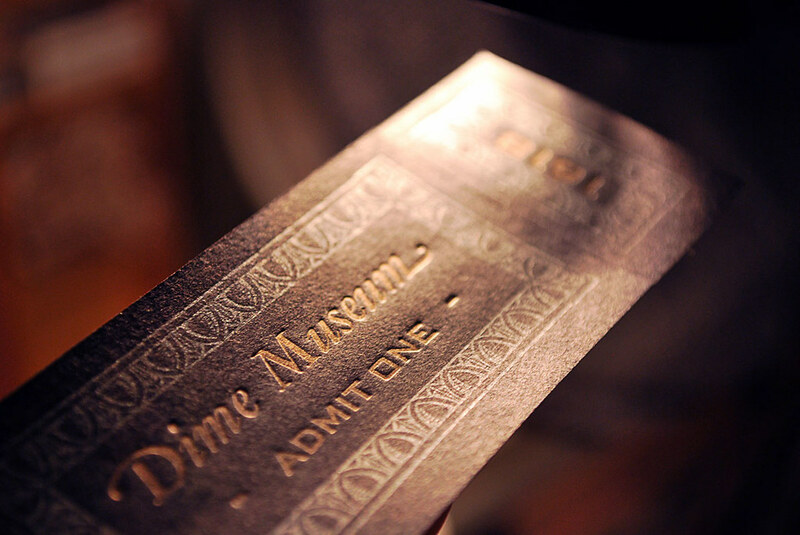 While the printing press in a box is wholely and splendidly admirable, the dime museum has quite stolen my heart. 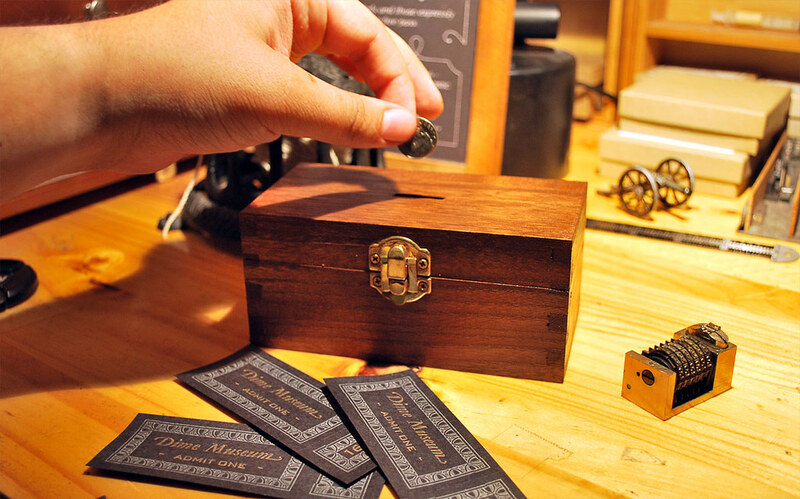 ...printing world smallest* bookplates with a world smallest complete** printshop in a box. 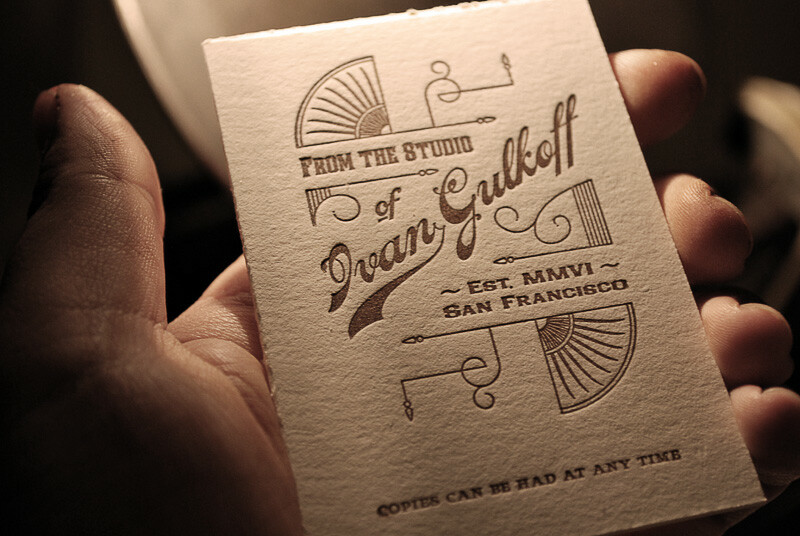 "They're the smallest bookplates being printed anywhere in the world at this instant." Odds are you would not be wrong. Splendid and lovely work. I love the detail and artifacts. 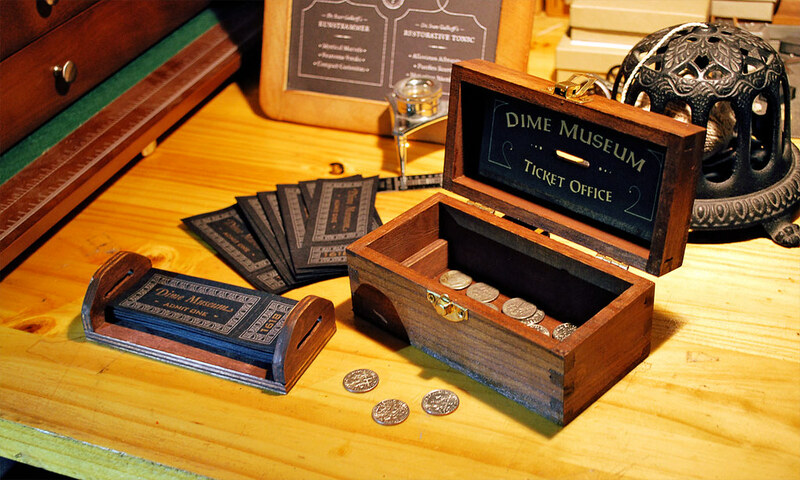 One important element missing from my diminutive Dime Museum, was a ticket office for collecting said dimes, and the actual admission tickets. 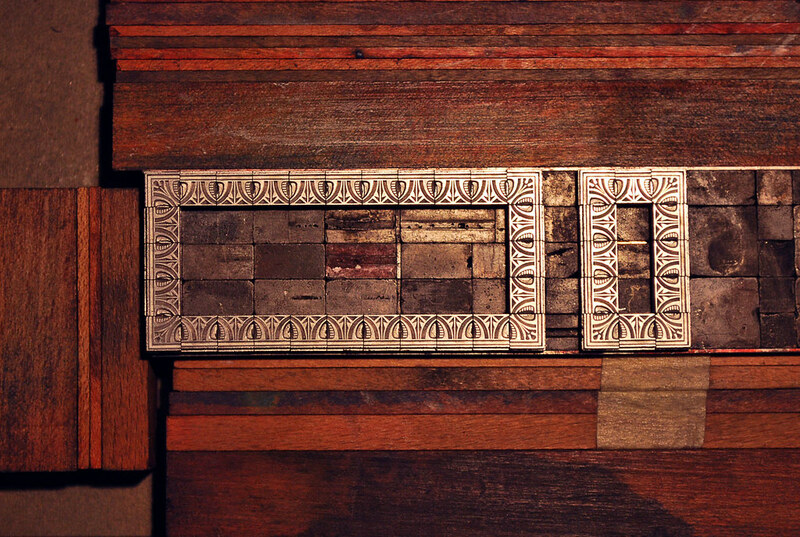 The decorative border form waiting for the first roll of silver ink. 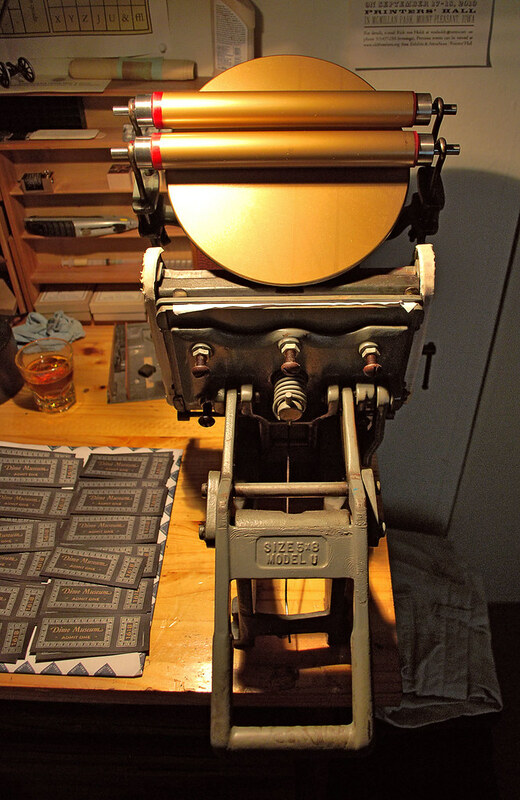 Printing the letters in gold on a trusty Kelsey press. The finished piece fresh off the press. Still smells a bit of oil. Detail of the printed piece, showing the slight "bite" into the paper. 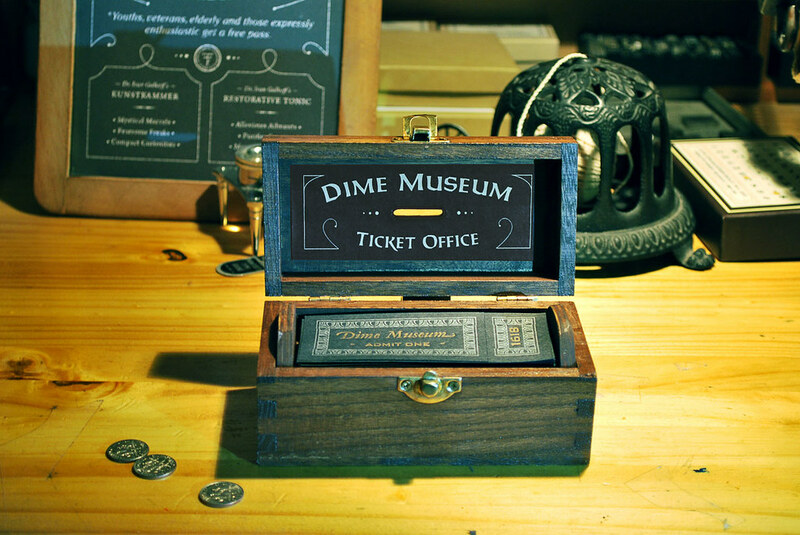 The new ticket office eating up shiny dimes. 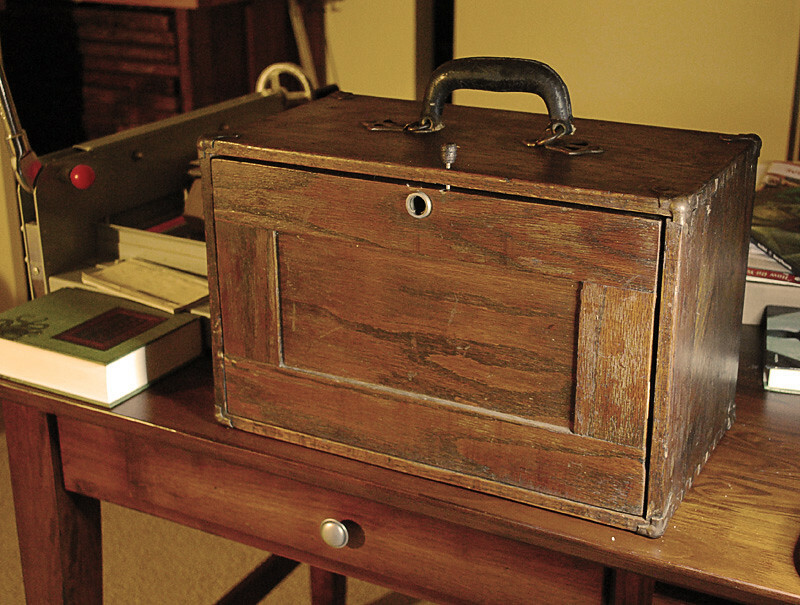 Inside the ticket office is a little insert tray for transporting and storing tickets. 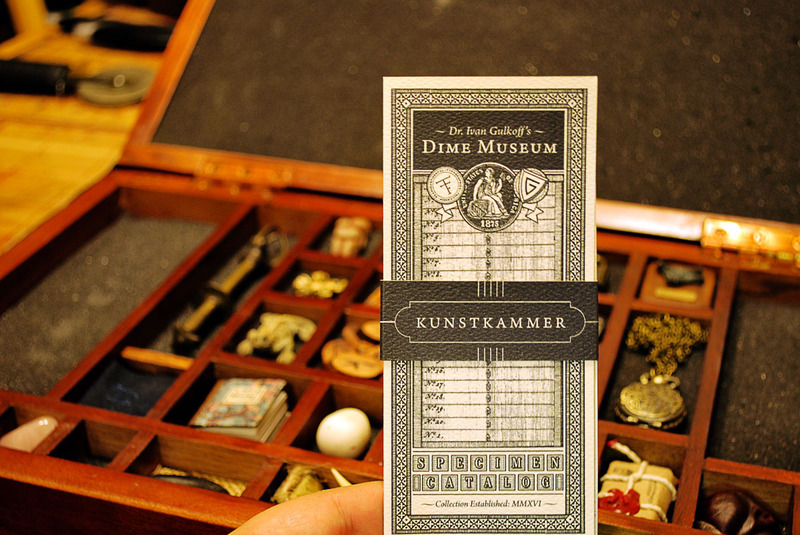 Once the tray is removed, dimes can be dropped through the slot, or scooped out by this curator's greedy hands. A small number of white tickets on fluffy stock was printed for special guests. I'll have my secretary pop around for my reserved "special guest" ticket. Fabulous work. 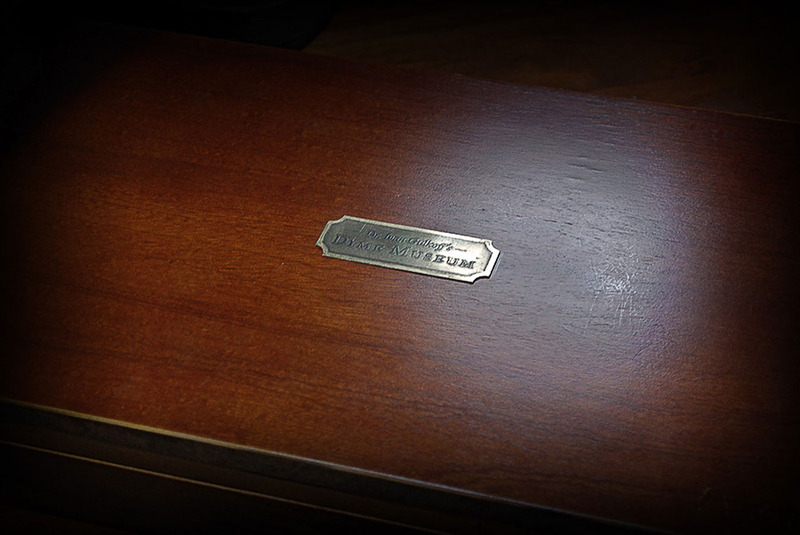 Everything has a palpable feel of authenticity about it. 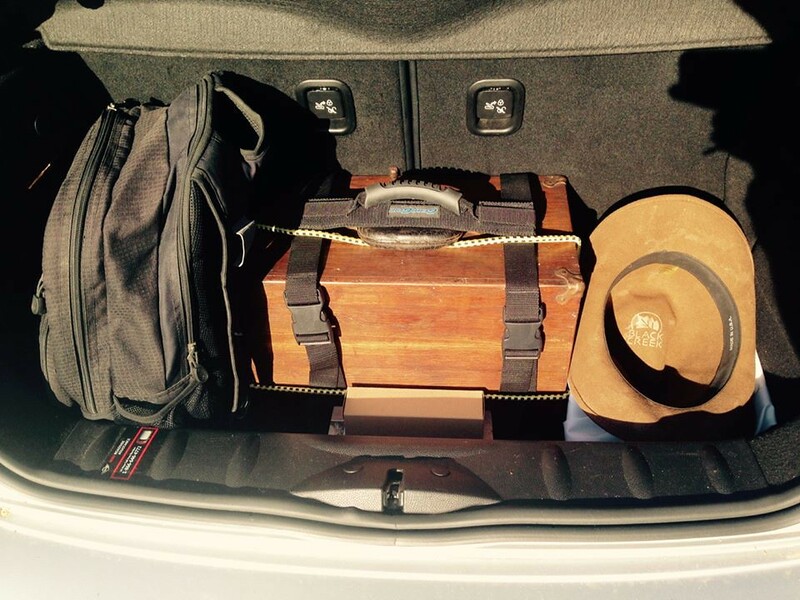 Your attention to detail is astounding. All the pieces came together at the local print show for the first time! 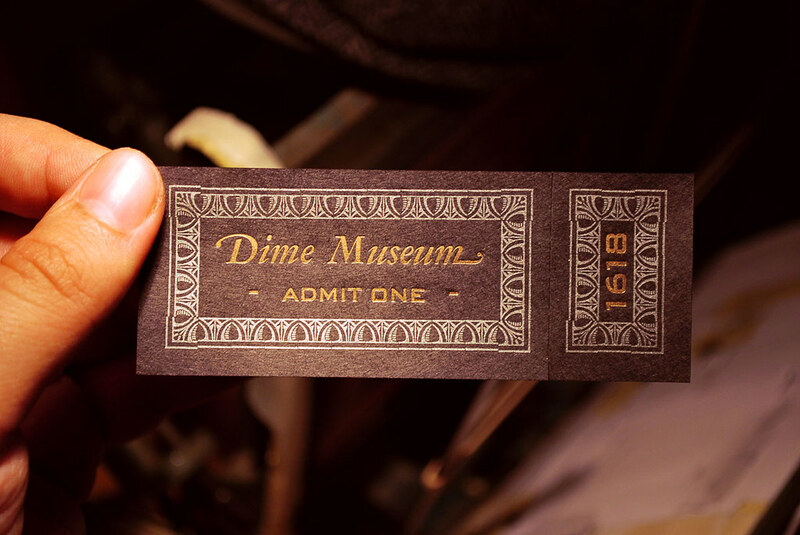 After paying the steep price of one dime, a visitor received a sip of the famed restorative tonic, pulled a handle to print their own admission tickets, and finally were allowed to marvel at the collection of candid curiosities.